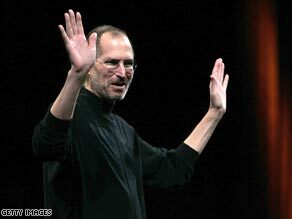 A Jobs-less Macworld - what's a fanboy to do? Ahhhh, Macworld. It's been like a post-Christmas Christmas for all us Appleholics out there. Once upon a time, there were TWO Macworlds, and Steve Jobs' keynote could be seen live! I remember calling feeds here at CNN to find out where I could see it, and there was usually a group of us sending IMs back and forth ooohing and ahhhing over our glorious Leader's every proclamation. Then after the keynote ended we'd continue to IM back and forth about all the things we wanted (pizza box iMac!!) that we didn't see, and arguing about why (or why not) Jobs was a genius. All that changed several years ago – Apple pulled out of the Boston/New York Macworld, and it died. No more live keynotes – we fanboys glued ourselves to the live reports on various gadget blogs by people actually in attendance. Now even that will end. And I have to think it's going to be hard for Macworld to continue. Which makes me wonder about trade shows in general. Clearly Apple wants the stage to themselves, and I'm sure we'll be just as excited about whatever new gadget, feature or upgrade the Leader sees fit to dole out to his salivating minions, but I can't help but mourn Macworld's passage. I've never been to the actual show, and now I doubt I'll ever get to go. I'm a little sad at the end of this era, and wonder if the new era will have any of that Christmas-morning excitement I used to get before a Jobs keynote. I wonder how January's Macworld will go down. I picture the crowd of Apple fans, a few of them teary-eyed, holding their cell phones aloft and swaying back and forth while singing some ballad after the last Apple-hosted keynote. More likely it will be a shuffling of chairs by people hurriedly going off to the next event.